On Friday night, the Braintree boys basketball team had myriad different opportunities to break a close game open and finish their senior night with a big win in front of their dance team, cheerleaders, and a group of Braintree Youth Basketball players. Unfortunately for the Wamps, Needham’s Jack Idelson and William Dorion refused to let that happen. 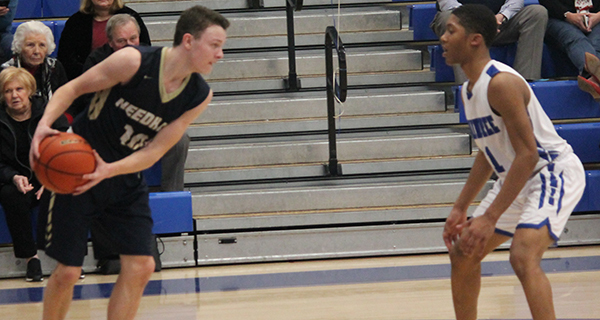 Needham’s first offensive possession culminated in a wide-open missed layup off a backdoor cut. This sloppiness and lack of execution was symbolic of how much of the first half went for the Rockets, who struggled to defend Braintree big man James Lannon almost every time he touched the ball. Late in the second quarter, Braintree led 28-20, but a deep, buzzer-beating three from Will Dorion would keep the game within five at the half. In the third quarter, Braintree again tried to pull away, leading 34-27 before a big corner three from Johar Singh once again kept the game close. 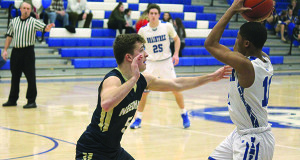 On two possessions early in the fourth quarter, Braintree would hit tough shots and seem to be in control, only to turn around and watch Jack Idelson beat their defense down the court for back-to-back transition layups. The breaks had the Braintree coach fuming, and he immediately sent the player at fault to the bench. Needham coach Paul Liner noted after the game that it was neither planned, nor something they saw on tape - it was just Idelson making a play. “We just try to get out in transition, push when we can, and Jack just did a great job getting out in transition,” he said. Shortly after, Needham went on their run. A made layup, followed by a steal and a layup from Kyle Sullivan and a corner three from Will Dorion, put the Rockets ahead, 46-42. Braintree then turned the ball over on a double dribble and took a timeout. A dagger of a three from the top of the key by Will Dorion would essentially end the game not long after, with Needham ultimately taking the victory, 55-50. After the game, coach Liner noted Dorion’s mental toughness after a rough start to the game. He also praised Idelson’s energy and defense. Liner believed it was his teams lack of toughness that caused so many issues early on, and that his team’s increased toughness played a huge role in their comeback victory. 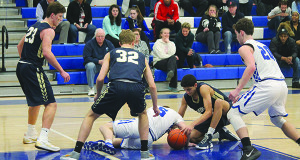 The Needham Rockets stopped that, and sent the Braintree seniors home with a missed opportunity - and an out-toughed, tough loss.